Early praise for God, Spies and Lies below. 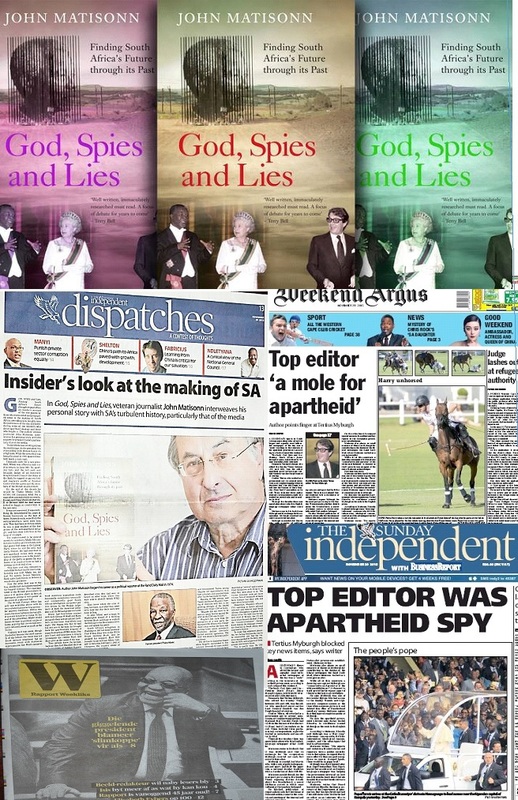 So begins GOD, SPIES AND LIES, an explosive insider's account since Mandela came to power of how South Africa got here -- and how things went wrong. It takes you into the room with Nelson Mandela and Thabo Mbeki, into the Oval Office of the US President and the British Prime Minister’s Chequers country estate, as the fate of southern Africa was being set before and after 1994. How Nelson Mandela studied the Afrikaner Broederbond to end white rule at the same time as he set up the military wing, Umkhonto we Sizwe in 1961. The story of the apartheid spy who fooled the white liberal elite. JOHN MATISONN has had a bird’s eye view of South Africa’s progress through apartheid and democracy. As a political correspondent, foreign correspondent and one of the pioneers of democratic South Africa’s free broadcasting environment, he interacted with every ANC leader since Oliver Tambo and every government leader from John Vorster to Jacob Zuma. Now for the first time this seasoned and erudite insider reveals the secrets of a 40 year career observing the politicians, their spies and the journalists who wrote about them. As a patriot, he argues that the way to a better future can be found through an unvarnished examination of the past. If you read one book on South Africa, make it this one! ‘A great example of the best in journalism: a well written, immaculately researched view of recent South African history. It provides so many nuggets of information, so many insights and revelations that it should be the focus for debate and discussion for years to come.